Man for all Seasons reaches new heights! We have clients, Kevin and Paula, in Mannamead who have been trying to organise more privacy for their back garden. A new block of flats is being developed behind their house, so they decided to order some Photinia × fraseri ‘Red Robin’ trees and asked Luke if he could come and dig them in and plant them in the correct way. 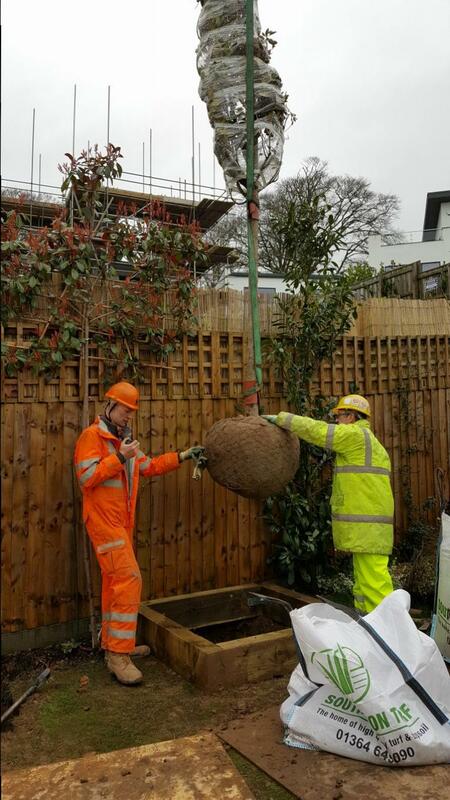 Luke happily agreed, dug the holes and asked the customer to let him know when the trees arrived. Arrive they did – and they were enormous! Much bigger than both the customer and Luke had anticipated, with rootballs three times the size of the pre-dug holes. Luke and his team turned up to complete the project but, finding that even four lots of hands couldn’t lift one tree, the original plan had to go out of the window. Luke spoke to the customer to explain that the schedule and the quote would have to be amended to accommodate this new project scope, and the customer understood completely. 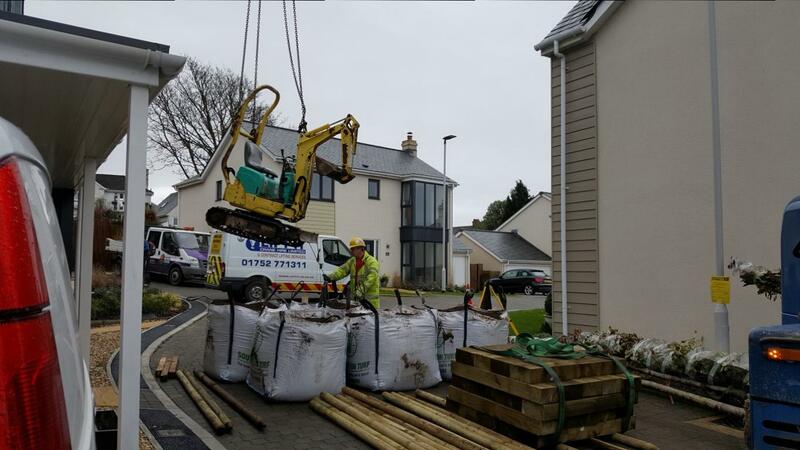 So we spoke to our friends at Lift It Crane Hire and South Hams Tool Hire to organise a crane and a digger, finding their quotes to be the most reasonable. Each team was happy to oblige and organised delivery and collection without fuss. They turned up on the day and helped us lift not only the trees over the house and into the back garden, but the digger and multiple bags of soil, too. Which was quite a sight to behold! Both the Lift It and South Hams Tool Hire teams were so easy to work with and got involved with the intricacies of the project, plus they were really friendly, polite and helpful. So we’d like to send a big ‘thank you’ to them all. We’ll definitely be enlisting their help again in the future. We built attractive raised beds around each tree using custom-cut railway sleepers from Southern Timber, added lots of fertiliser to the soil to get the trees off to the best start and staked them in securely. Mark then had to use his ladder to climb up and remove the plastic wrapping from each tree. The whole project was quite an undertaking and certainly pushed our creativity and resources to the limit! But we loved the challenge, and we were proud to get the whole job done inside a day, keeping the extra costs to a minimum. 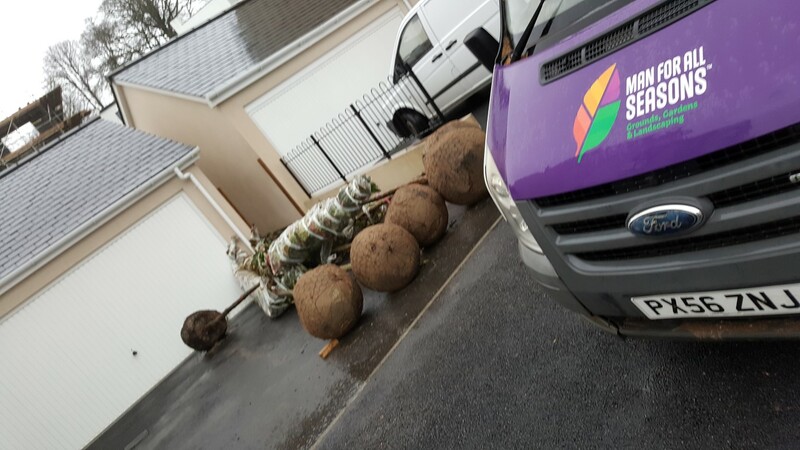 The customer is thrilled with the results, and we’re thrilled to prove that, with the right support, we can plant pretty much anything! Want to put us to the test? Get in touch to tell us about your grand plans.